In the midst of a region in turmoil, where the very future of religious minorities seems to be at stake, Lebanon has always been known for its rich diversity of faiths. With a population of only 4.5 million people, the country hosts more than 1 million refugees and officially recognizes 18 different religious communities among its population. Lebanon’s diversity has also posed significant challenges. The country’s history indicates the potential for religious tensions to escalate, especially in a broader context where sectarian violence has ravaged both Iraq and Syria and threatens to create fault lines across the region. The war in Syria has specifically had an impact on the country’s stability and raises questions about the future of its minorities. 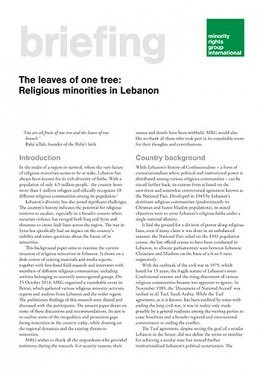 This background paper aims to examine the current situation of religious minorities in Lebanon. It draws on a desk review of existing materials and media reports, together with first-hand field research and interviews with members of different religious communities, including activists belonging to currently unrecognized groups. On 25 October 2014, MRG organized a roundtable event in Beirut, which gathered various religious minority activists, experts and analysts from Lebanon and the wider region. 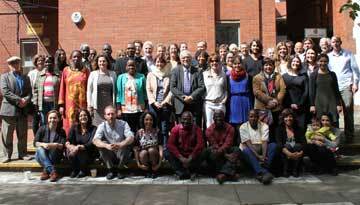 The preliminary findings of this research were shared and discussed with the participants. The present paper draws on some of these discussions and recommendations. Its aim is to outline some of the inequalities and protection gaps facing minorities in the country today, while drawing on the regional dynamics and the existing threats to minorities.